Of course, to translate, you must know the language. Our raws have special case. We use the GFantasy raws for translation (because our translator is a Japanese) but we encode it into Chinese raws. There isn’t much difference in the text, anyway, but I’m not sure about the extras. To start off, you can use MS Word or other programs alike, and then encode the text. 1. One text cloud, one line. 2. Be typesetter friendly, use guide marks like 3rd panel, lower panel, small text with *insert the name of the character here*, SFX and such markers to help the typesetter where he will encode it. 3. Each character speaking must have a space between them, no matter how short his/her statement is. 4. Never miss a translation. Whether your own/translator’s informative notes (to help the readers), SFX or author’s note and such, put it there with a note in parenthesis, it’s the typesetters discretion to encode it or not, not yours. 5. At times when translators encounter weird phrasing or un-character-ed text cloud, you can always make a note or comment inside parenthesis to warn the typesetters and editors if it needs rephrasing. 6. If the page doesn’t have text at all, put the page number header and indicate “no text” within parenthesis… It’s easier for the typesetter like that. 7. Submit it to the editor first through posting to the respective project discussion board or ZIP it up and host it for download. Bard: If I put a stone inside, it’ll be deadly! Randall: Damn it! This is the 20th one now! You haven’t caught the culprit yet, Abberline??? Ciel: Sorry to be such a brat. Aberline: Hey! How the heck did you get over here? Randall: Earl Phantomhive… Why are you here? I’m here to clean up the mess created by an old useless hunting dog. A crime targeted only at the people who have returned from India. It seems that the victims are not dead. Ciel: If it was just a highwayman, I wouldn’t be here. But, I won’t just sit and let the royal family be disgraced. The criminals are described as “Chosen children of apathy and immorality,” which is accurate. I agree that England would be better off without India’s wealthy upstarts. (text boxes next panel: The British Empires Dominion of India. Can live like aristocrats in India. Those who return from India are now called Anglo-Indian. Randall: Those are cowards who were too busy with lavishness and rubbish pastimes. Most of them are from the upper class of this so-called Great Britain. Randall: HE’S MAKING FUN OF US BRITISH AND THE QUEEN! WHAT A FOOL! Targeting those who return from India only means that the criminal is a vulgar Indian barbarian!! Ciel: (text cloud on Aberline’s panel) So that’s why you called for me? (second row of panels) A mainstream of smuggling Indians have a monopoly in the East End. I can see that even the city yards don’t know what to do with a dark street like East End. It’s hard to recognize the route and the exact number of smugglers, right? I want to return to the manor house quickly. Sebastian, did you remembered those documents? Ciel: Let’s go then, Sebastian. Aberline: Chief Randall, really, who is that kid…? This country has a sternly secret executive organization directly under the control of the Queen. (white text on the black panel) The Phantomive Family has served for generations. 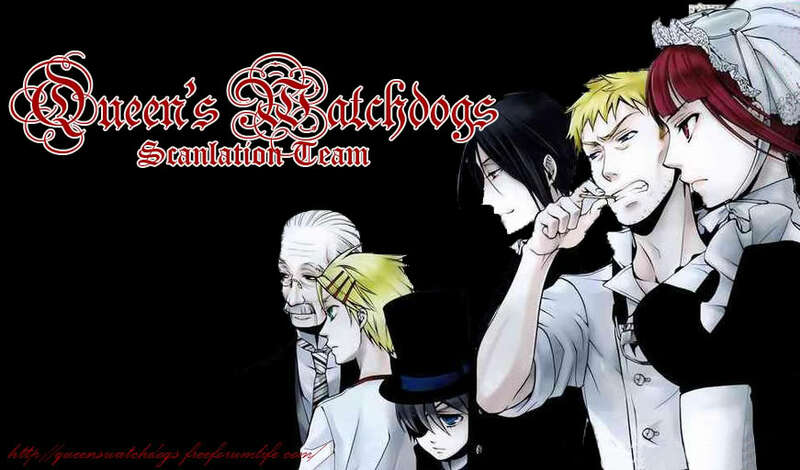 They are called the Queen’s Watchdogs… also known as “The Evil Noblemen”. Aberline: Why the heck they’re called Evil Noblemen? They’re serving the royal family like us, right? Their task is not as easy as ours. Every country has a surface world and under world at the same time, too. Great Britain is not an exception. (black panel text) The Phantomhives is a dark organization that covers up all of the royal family’s secrets and eliminates every thread of linking the royal family’s involvement to dirty work. (on the other side of the black panel) A “phantom” is something a royal family shouldn’t have. …is where the people involved with multinational underworld gathered here in this country. Aberline: In other words, it’s the opposite of the police. Randall: They use wicked authority to carry out the Queen’s ideals. Ciel: Is this the right place? (next panel) Please watch your step. I always knew you would come. Ciel: and what kind of day is this supposed to be? (second row panel) How have you been? (small text: Ah!) Wasn’t it your birthday recently? Belated! Ciel: I don’t care about that thing. I have been investigating “that” incident. Lau: I don’t like you putting it like that. The numbers of people who move in and out of this street are under your control, right? Lau (??? not sure if it’s Ciel, though): Of course, I have done what you asked. Lau: It’s the bribe that allows me to do business in this country’s underworld. Lau: Well, first and foremost, I gotta ask you one thing. Dear all, do you want to translate the monthly chapters? I'm currently working on the Chapter 47 too..
Liesel wrote: Dear all, do you want to translate the monthly chapters? I'm currently working on the Chapter 47 too..